Many developing economies have a current (static) comparative advantage in producing primary products (minerals, agriculture). However, in the long-term producing these primary product goods have certain disadvantages. Low-income elasticity of demand. As incomes rise, demand for primary products increases only slowly. Therefore relying on primary products limits economic development. Price volatility. Many primary products have a volatile price because supply and demand are inelastic. In this case, it is good to diversify the economy. To diversify the economy, developing economies could try to develop new, manufacturing industries. However, in the beginning, they may struggle to compete against foreign rivals. This is especially true if they lack access to capital markets and find it harder to borrow for investment, Tariffs help provide a domestic market for the new firms. This gives new industries a chance to get established. Over time, the new industries will become more efficient and benefit from economies of scale. At this time the tariffs can then be reduced. Furthermore, it is argued many developed economies had a period of tariff protection, e.g. Great Britain, US, Germany and, in recent times, South East Asian economies. 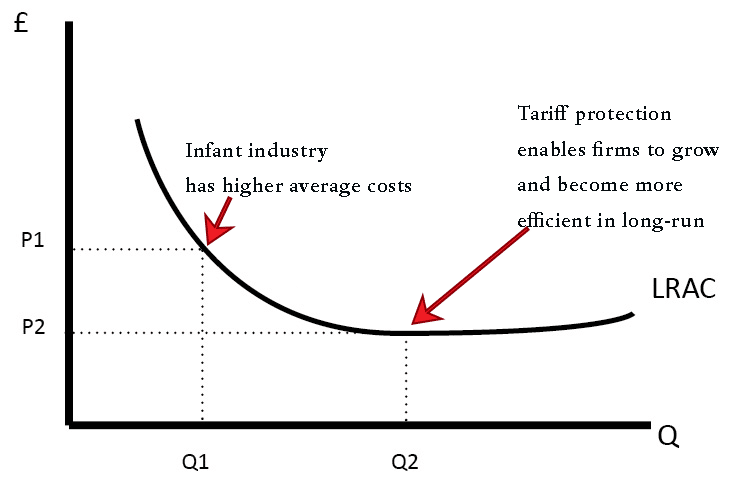 The infant industry argument is an important justification for tariffs at certain stages in economic development. Friedrich List, The National System of Political Economy (1841) argued that protectionism could be justified for an economy trying to develop new manufacturing industries. He argued countries like Great Britain, who used protectionist policies then later tried to insist on pure free trade – were “kicking away the ladder” for poorer countries. Ha-Joon Chan, Bad Samaritans: The Myth of Free Trade and the Secret History of Capitalism (2008) makes similar arguments, updating the arguments on free trade and arguing there has been a similar situation with developed countries keener to promote free trade deals, once they have benefitted from protectionism. Chan argues that developed countries often want to ‘kick away the ladder they used to develop’ He argues that developing economies are justified in promoting tariffs to develop new industries which offer long-term growth. 1. May encourage firms to be inefficient from the start. If a developing industry has an effective protection from competition, it may lack the competitive pressures to be efficient and be ready to compete. The tariff protection can create a complacent feeling, which means firms are not ready when tariffs are reduced. 2. Retaliation. A problem with putting tariffs on imports is that other countries may retaliate and put tariffs on their exports. Therefore industries with a real comparative advantage may suffer from tariff protection and lack of free trade. 3. Political pressure group. Once the industry has got used to tariff protection it may become politically difficult to remove because of vested interests. 4. Which industries to choose? It can be difficult for a government to choose which industries to protect and develop. Often developing economies have struggled to ‘industrialise’ according to government plans. Tariffs may not be enough to develop a car industry in Central Africa. 5. 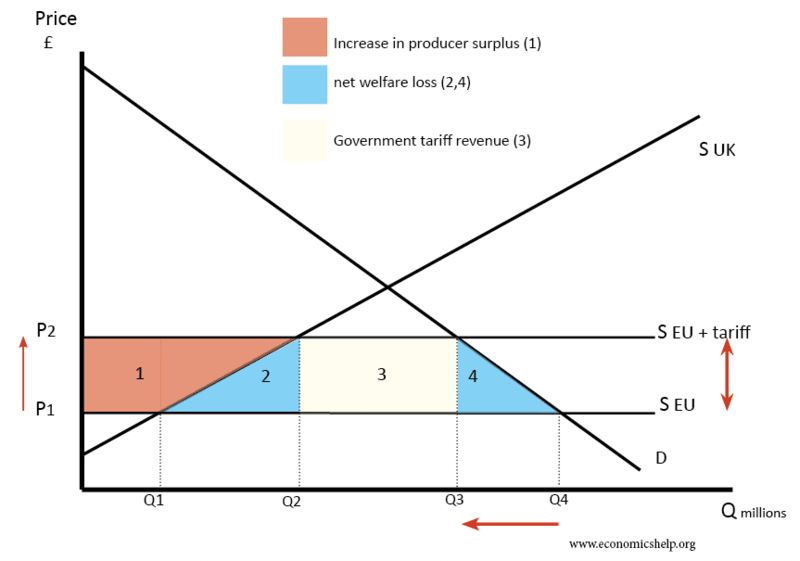 Welfare loss of tariff protection. Tariffs may have benefits for some domestic producers, but they also have costs for some domestic consumers, who pay higher prices, leading to a decline in consumer surplus. This means consumers have a lower disposable income to spend on other domestic producers. Also, tariffs on imports may hit domestic firms who need to import components and machines. 6. Alternatives to tariff protection. As an alternative to tariffs, there may be a stronger case for government subsidies to provide capital to start new industries. This improves competitiveness without the welfare cost of tariffs. Although many developed countries used tariffs in their period of economic development, this does not mean per-se – tariffs were the reason for development. For example, it could be argued the US was successful – despite high tariffs raising prices and discouraging competition. A stronger argument to justify US economic success are factors, such as high levels of literacy, entrepreneurial spirit, access to raw materials, mass immigration and relatively stable political situation. Other countries, such as India and China have experienced different outcomes. During periods of inward-looking protectionist policies, their economic growth was weak. However, with trade liberalisation, their infant industries have been exposed to more competition and this has helped economic growth. GATT did allow developing countries scope for developing selected industries. Many tried in the 1950s and 1960s with varying degrees of success. Could I please ask you where you got your facts regarding India and China infant industry arguments? I am writing an essay and I would like to know before stating it as a fact.